Historian Bailey Diffie specialized in medieval and early modern Portuguese history, as well as in that of colonial Brazil and Latin America. Bailey taught at City College in New York, Columbia University, the University of Washington, and the University of Texas. His major publications include Puerto Rico: A Broken Pledge (1945), Latin American Civilization: Colonial Period (1945), Prelude to Empire: Portugal Overseas before Henry the Navigator (1960) and Foundations of the Portuguese Empire, 1415-1580 (1977). Diffie's teaching career as well as his influential work, Latin American Civilization established a significant place for him in the field of Latin American Studies. SERIES I: CORRESPONDENCE, relates to publication, teaching appointments and Diffie's experiences in Brazil in 1941. Society for the History of Discovery Newsletters and memos to Columbia University faculty also appear in this series. Topics include the results of a survey of attitudes in Brazil during World War II and a critique of United States policy towards Latin America. that is the course she will follow if possible." In addition to this analysis, Diffie also describes the customs and "psychology" of the people and presents his views on several issues. Diffie argues against incorporating Latin American studies into the curriculum of American primary and secondary schools. He opposes the additions because they will displace rather than supplement European studies which he judges to be more significant. In a section "On Propaganda" Diffie argues that an American campaign to win Brazilian support during the war would be ineffective. SERIES II: WRITINGS, consists of numerous chapter drafts of Latin American Civilization, and notes, chapter drafts and completed copies of a Prelude to Empire. Drafts of articles include "How Bad Is the Good Neighbor Policy?," "A Latin American Policy for Americans--Democrats and Republicans," "Evolution of Latin American Culture" and other articles. Notes on Brazil, the Monroe Doctrine, on Latin American history and other miscellaneous writings are arranged in this series. 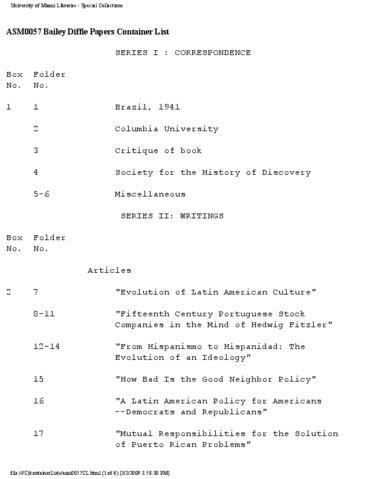 SERIES III: TOPICAL FILES, includes bibliographies on topics in Latin American and Caribbean history such as Indians and African-Americans, individual Latin American countries, Amerigo Vespucci, religion, revolutions, mining, and other topics. Also included in this series are book lists, classroom materials such as syllabi and course outlines, programs and bulletins from various conferences on Latin America, copies of Foreign Policy Reports and other reprints and journal issues. Papers on Latin American history include both student papers written by members of Diffie's classes and professional papers presented at conferences and seminars. Newspaper clippings in the series date from 1934-68 and relate to rumors of communist revolution in America circulating in 1934; other articles concern Portugal and the role of women in overseas expansion, and communism in Latin America. SERIES IV: RESEARCH MATERIALS cotains files compiled by Diffie in the course of his scholarly research efforts. Bailey Diffie Papers Finding Aid © 1994 University of Miami. Requests to reproduce or publish materials from this collection should be directed to asc.library@miami.edu.